The mountain doesn't end at the top of the skilifts. Take your freeride experience to greater heights. 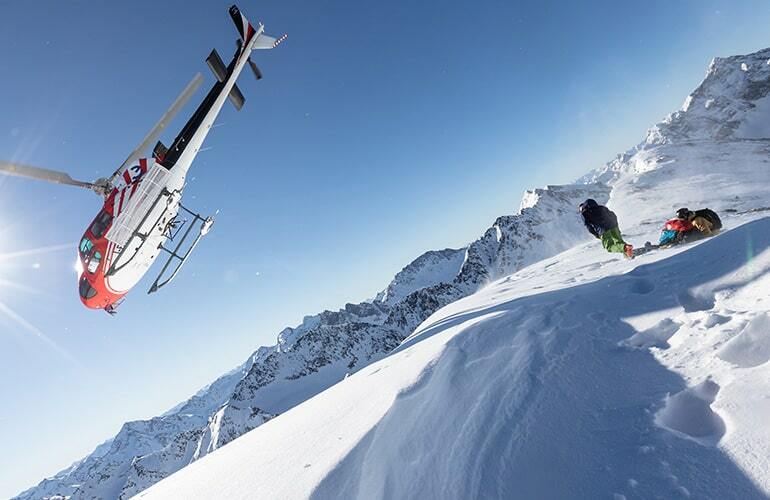 Access the resort's wildest peaks by helicopter. Experience what it's like to ski across immaculate open spaces away from the usual off-piste routes. 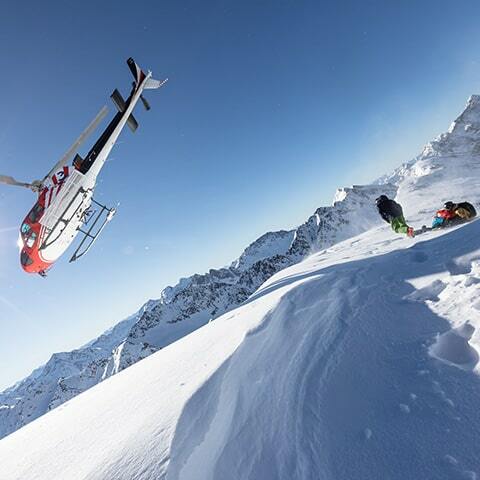 Heli-skiing is something you should try at least once in your lifetime. The heli-ski experience takes off from the top of the Carosello 3000 San Rocco gondola (no.11-12 view on the map). Before the activity there is a briefing with participants to explain the plan for the day and provide basic safety information. Throughout the experience you will be accompanied by a UIAGM Alpine Guide. 1 helicopter ride for an amazing powder descent, till reaching the valley of Livigno. It is possible to add more rides. The price includes accompaniment by an IFMGA Mountain Guide. It is mandatory the use of the material self-rescue: ABS backpack, avalanche transceiver, shovel and probe. Possibility to rent the kit (complete or partial) at the special price of € 10.00. Two helicopter rides to enjoy two amazing descents returning to the Livigno valley at the end, plus the chance to add further descents should you so wish. The outing is preceded by a briefing with participants explaining the plan for the day and providing basic safety information. this package includes 2 helicopter rides accompanied by a UIAGM mountain guide. Rescue materials must be used: ABS rucksack, ARTVA avalanche transceiver, spade and probe. Full and partial kids can be hired for a special price of €10.00. The excitement of backcountry skiing and snowboarding combined with the experience of heliskiing during a short, 2 day break in Livigno. A UIAGM mountain guide will be at your disposal to accompany you as you discover the very best slopes that can be reached by helicopter, the installations or climbing skin skiing. the package includes 5 helicopter flights, the company of a UIAGM mountain guide for 2 days and rescue materials(ABS rucksack, ARTVA avalanche transceiver, probe and spade). The excitement of backcountry skiing and snowboarding combined with the experience of heliskiing during a short, 3 day break in Livigno. An IFMGA mountain guide will be at your disposal to accompany you as you discover the very best slopes that can be reached by helicopter. The installations or climbing skin skiing 5 or 10 helicopter flights, the company of a UIAGM mountain guide for 3 days and rescue materials (ABS rucksack, ARTVA avalanche transceiver, probe and spade). A week of freeriding in the company of a UIAGM mountain guide who will accompany you as you discover the very best descents that can be reached by helicopter, the installations or climbing skin skiing . Every day you’ll get the chance to try out different slopes, which you will also reach by helicopter. The package includes 5-10-20 helicopter flights, the company of a UIAGM mountain guide for 6 days and rescue materials(ABS rucksack, ARTVA avalanche transceiver, probe and spade). Get details about the heli-ski experience. Fill in the form to give us a few details. We will get back in touch with you. Warning: Off-piste skiing is a dangerous and risky activity. Carosello 3000 S.r.l. and Sitas S.p.A. do not accept any responsibility for accidents or injuries which occur outside the marked pistes.